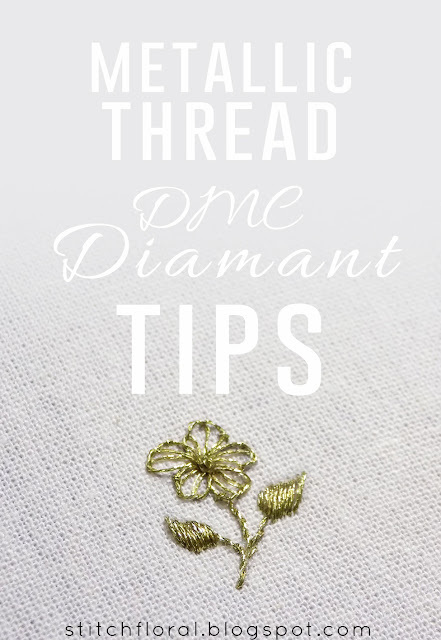 Many of us want to add some extra shine to our embroidery but I bet just as many are scarred for life by the 6-stranded metallics that you can usually find in the stores along with the regular embroidery floss. I mean, at least for me, that was probably the worst experience in my embroidery life so far. 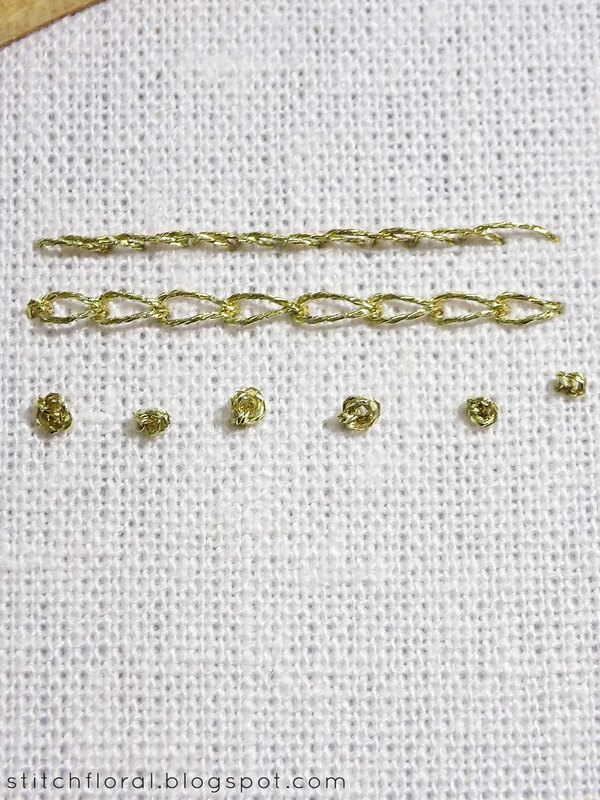 I was actually considering making a comparison post between the 6-stranded metallics and DMC Diamant, but I didn't find the courage in me to go through that pain again, haha. What I'm leading to, is if you want to use metallics in your stitching, I can definitely recommend DMC Diamant. 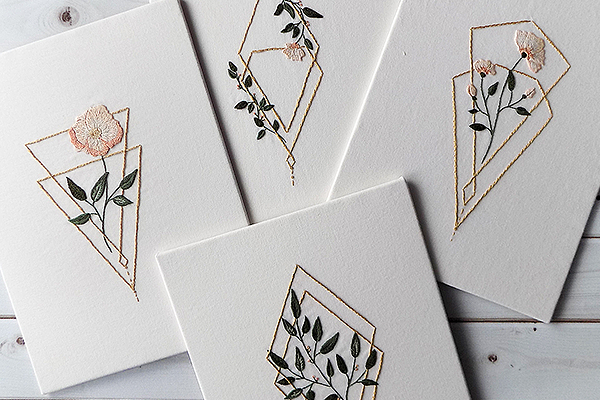 It is SO MUCH easier to work with and the result doesn't disappoint. But, like always, there are a few points and tips to discuss, so let's get to it. Before we begin, I just want to mention, that it is not an ad and I'm not getting anything out of the review. It's all purely my experience and opinion. DMC Diamant is a spoon of a single strand thread, but this one strand consists of 3 plies. 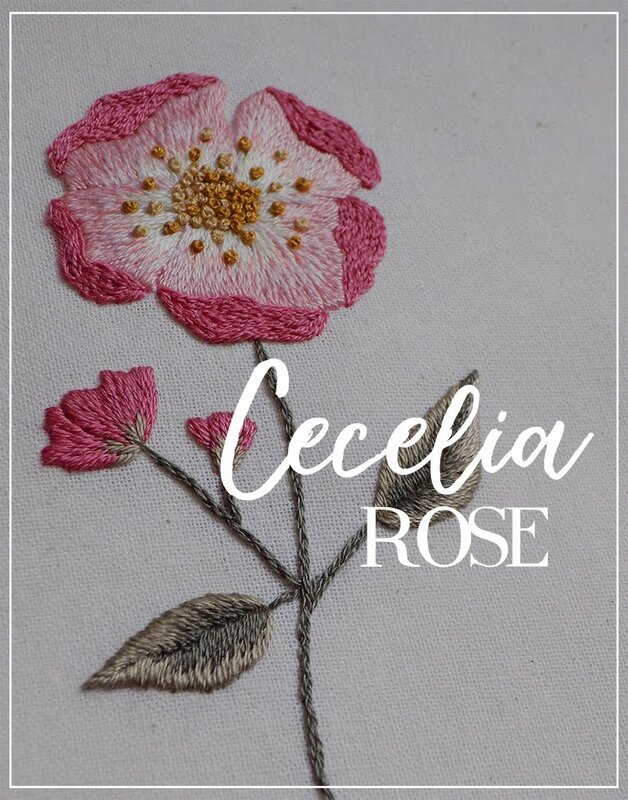 It passes through the fabric with ease and, although it IS a bit more rigid than regular cotton floss, it is still pliable enough to work various stitches with it. 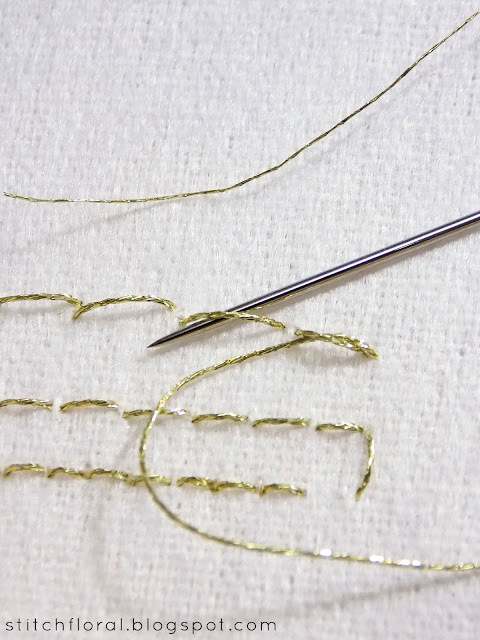 Let's practice a little to understand thread better in action. First of all, I want to note that the thread frays a lot. 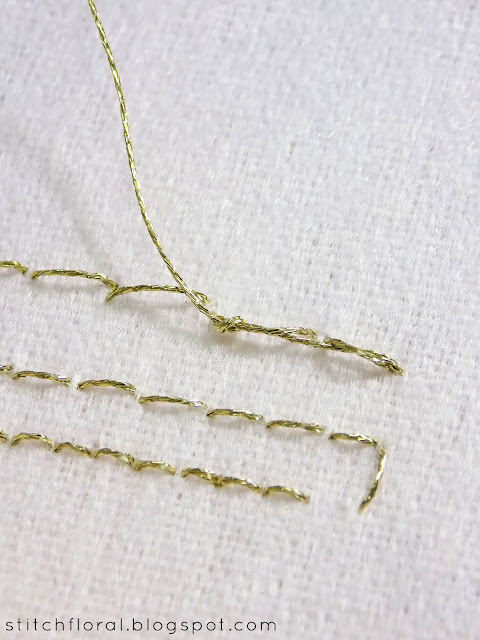 The 3 plies that form a strand are not twisted as firmly together as in cotton floss. So when you cut it, they start separating and going different directions at once. 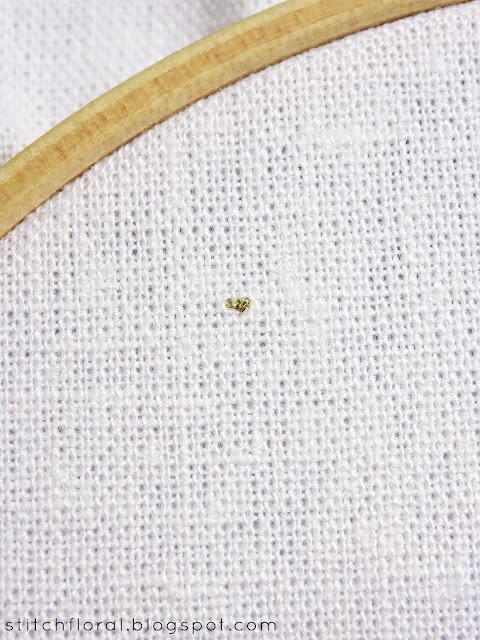 You will not have troubles passing the thread through the needle eye, though, as long as the eye is big enough. 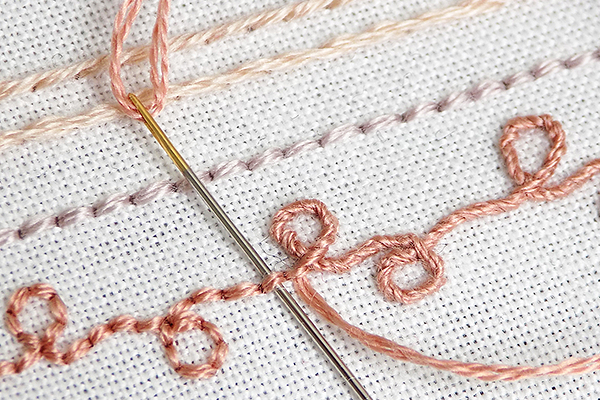 As for starting the thread, I usually use anchoring stitches and it workes just great. Make a tiny stitch in the area that will be covered, then add a tiny stitch next to it and go to the starting point of your stitching. 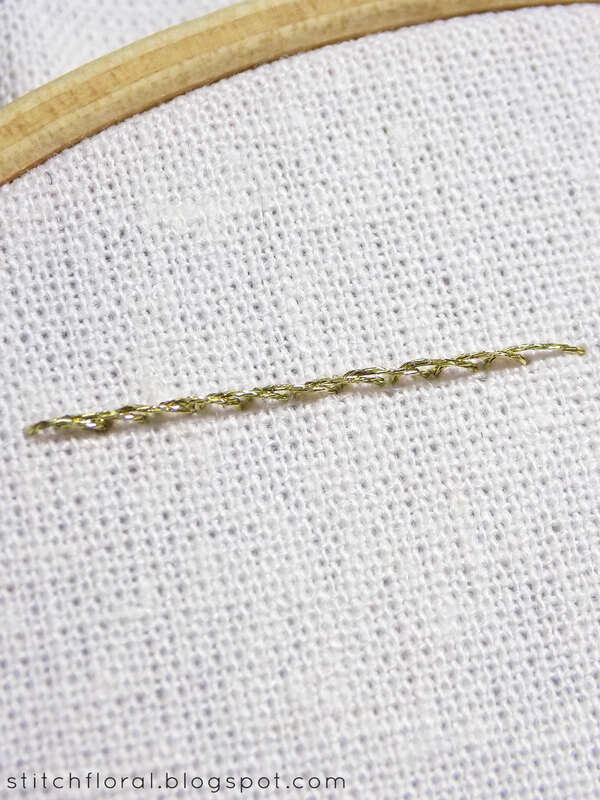 So, let's see how the stitches worked with this thread look like. As you see, the line of stem stitch and quite neat and nice, and I can say there wasn't any trouble working it. 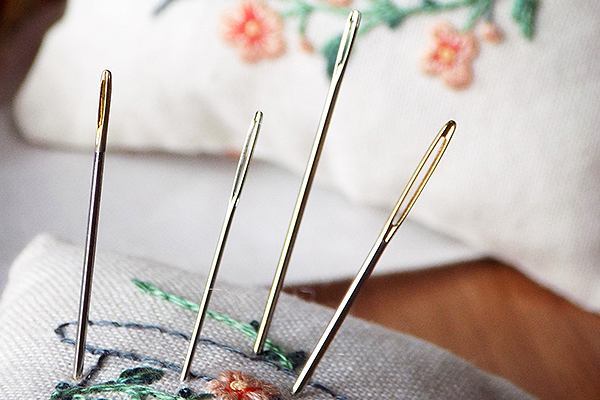 If you look at it from this angle, however, you can see that the stitches rise quite high above the fabric. This is something to be aware of when you work with this metallic. The thread IS a little rigid so the stitches will rise to an extent. 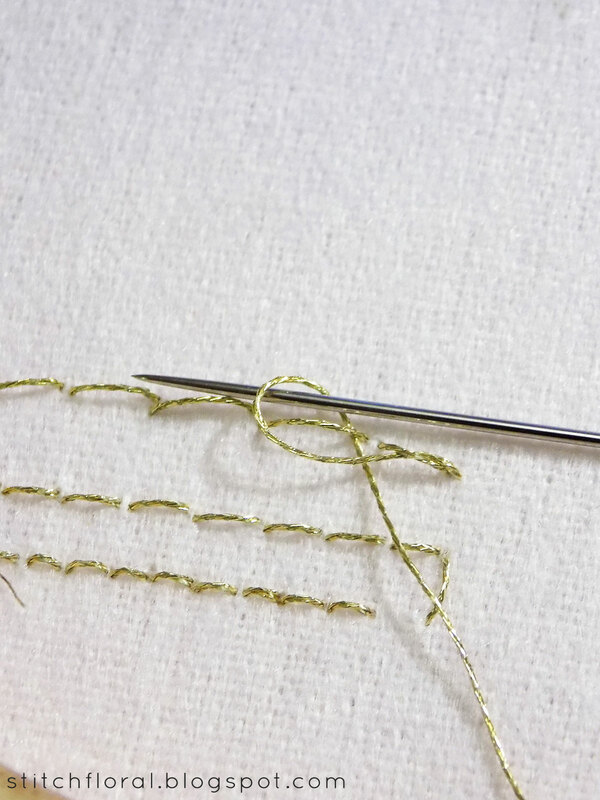 As you stitch, the appearance of the thread doesn't wear down that much (that is, if you cut it in a correct length, of course. Around 1 forearm is usually the length I use with this metallic). But the end of the thread does wear down and fray more and more. I trim the end gradually because you can't use the frayed part anyway. Here's how stem stitch, chain stitch, and french knots look like in this thread. French knots are made with 2 wraps around the needle. 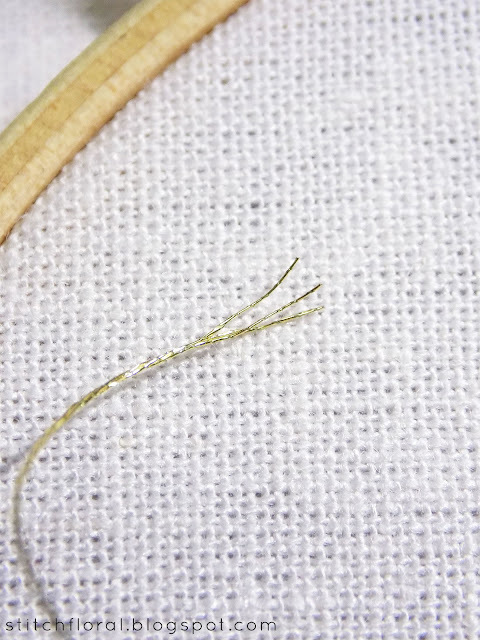 They are a little challenging to work with this thread because it is stiff, after all. 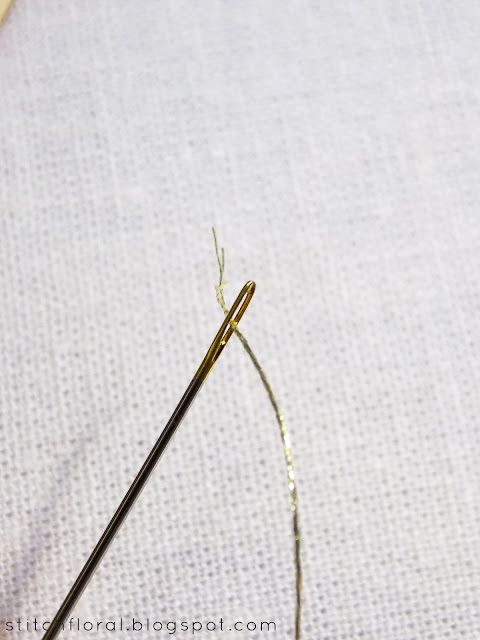 But still possible, as long as you hold the working end of the thread carefully. To end this metallic, it's better to make a knot on the other side. Pass the thread under a couple of stitches. As you do that, slide the needle through the loop. 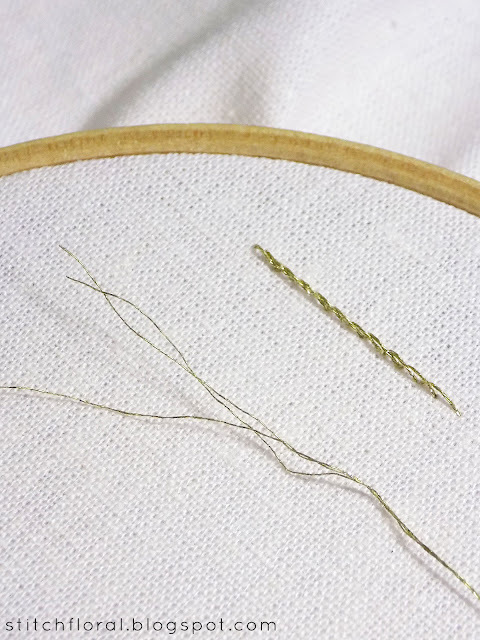 And pull the thread carefully until a knot forms. After that pass the needle under a couple more stitches and snip it. It will hold fast enough to not undo. But if you plan to use it on some items that will be in use (like a clutch, or a bag, or a cap) then I personally would go for 2 knots to be safe. Here's more that you can create with this thread. As you see, it works fine with buttonhole stitch and satin stitch as well. 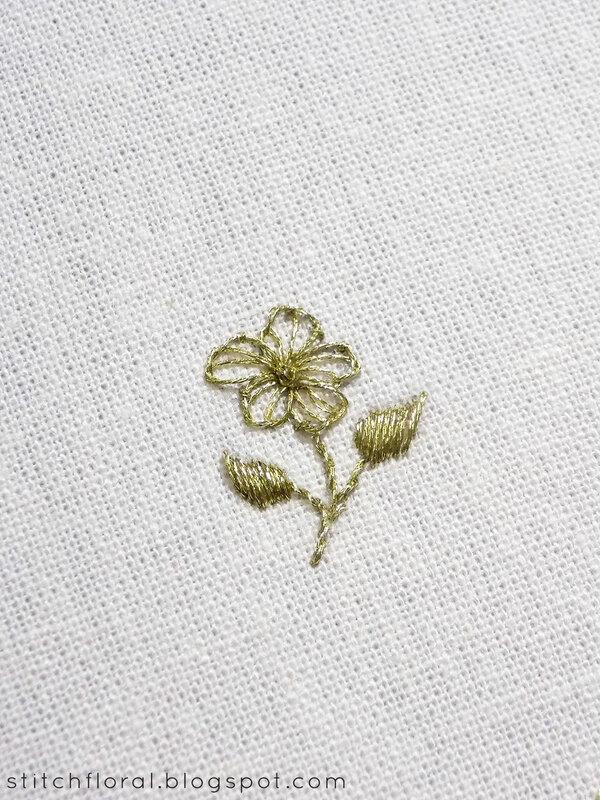 Well, if I'm completely honest, satin stitch is a bit of a struggle, because it is hard to bring the needle in such close proximity of the previous stitch. And also because the stitches rise above the fabric, so if you look from a different angle, it looks like a dome, haha. Don't be scared to try this metallic out! 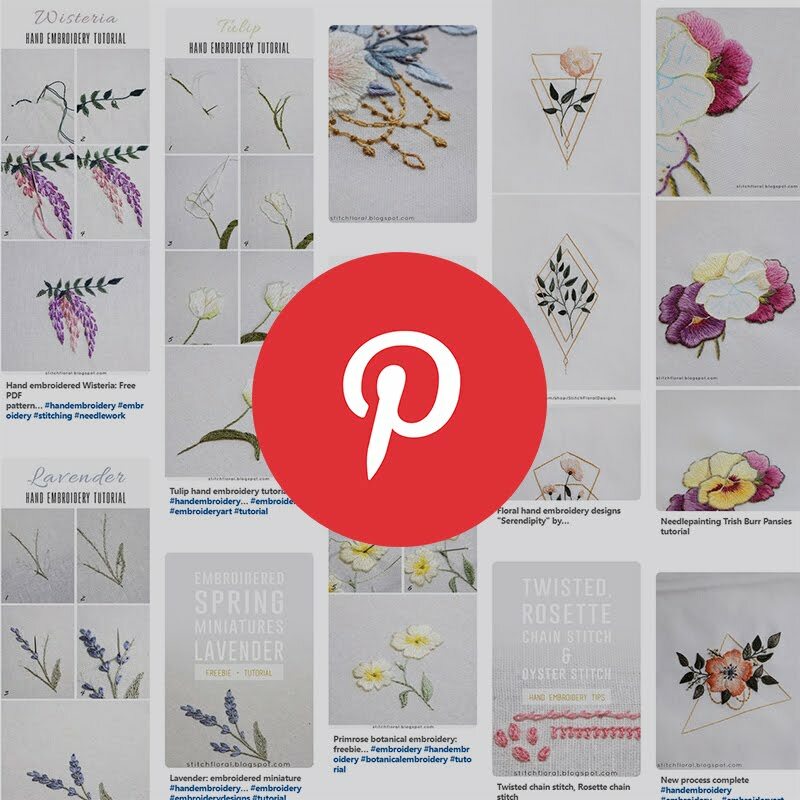 It can be used alone to create some charming pattern, or you can use it along with the cotton floss to add some spark and shine. 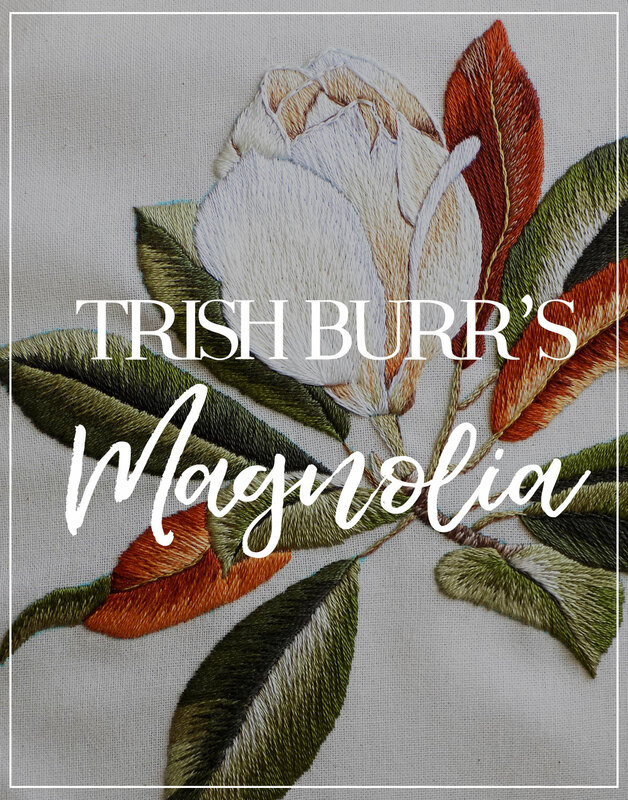 There are many possibilities to how you can utilize this thread, so feel free to explore. 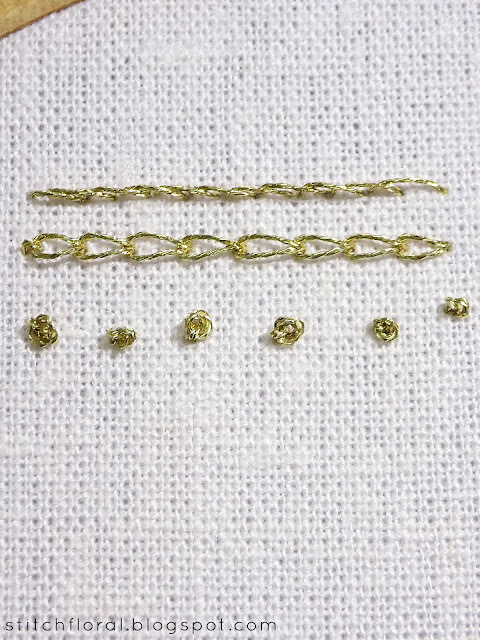 I can just assure you that this thread will grant you a more pleasant experience and more gratifying result than the 6-stranded metallics, haha. I love DMC Diamant too! 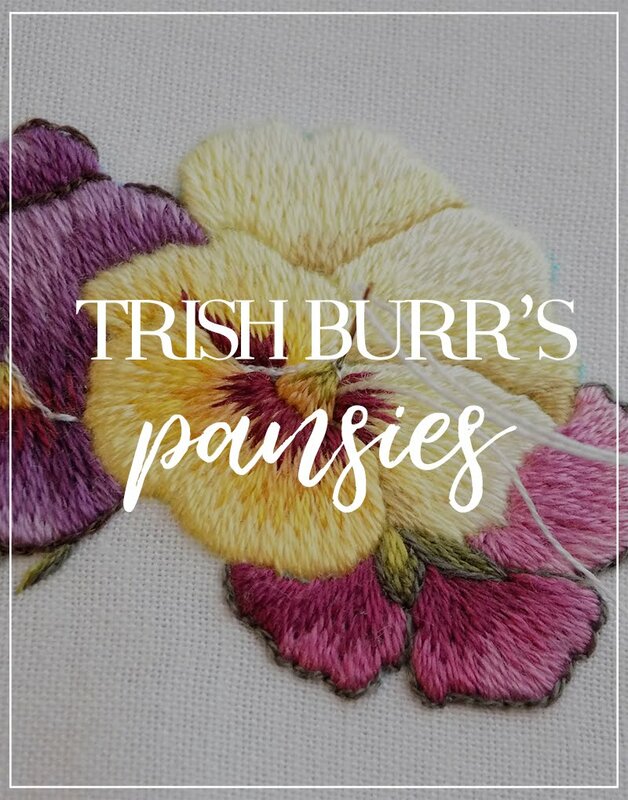 So far, I've only used it in cross-stitch. 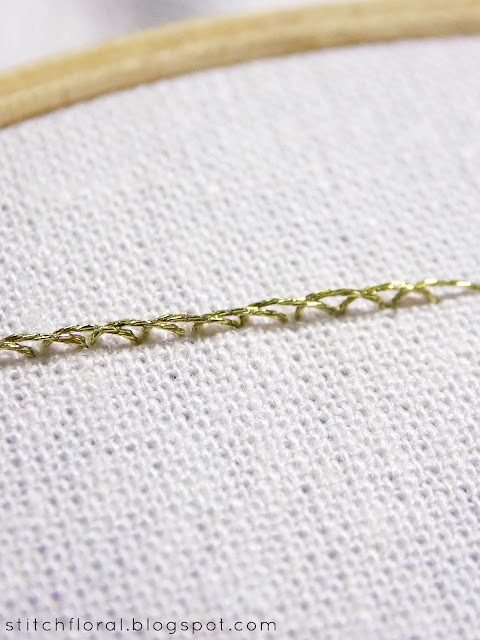 It is a bit springy and tends to stand off the fabric but the shine is gorgeous and it shows the stitch definition so much better than the stranded metallic floss. I actually enjoy Light Effects floss too, although it is difficult to stitch with at times and requires a bit of patience. 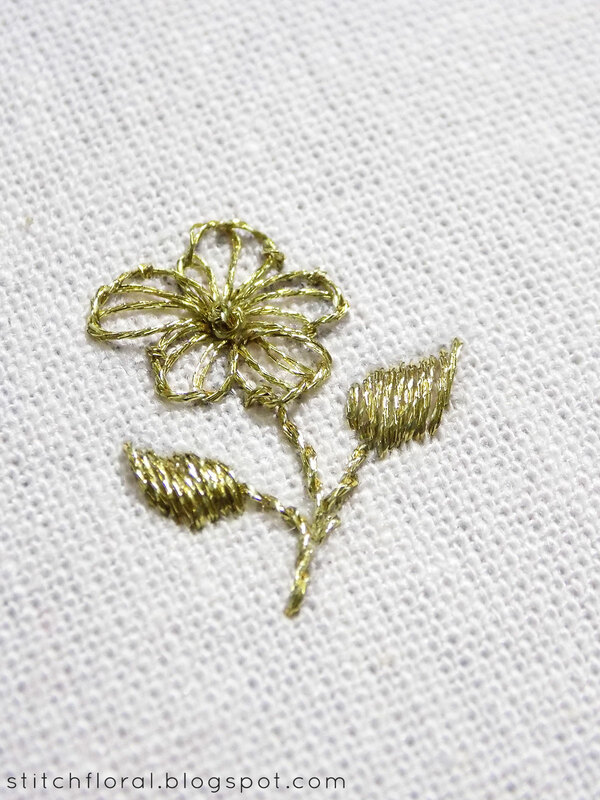 I love your little gold flower embroidery, so pretty! I haven't tried Light Effects! 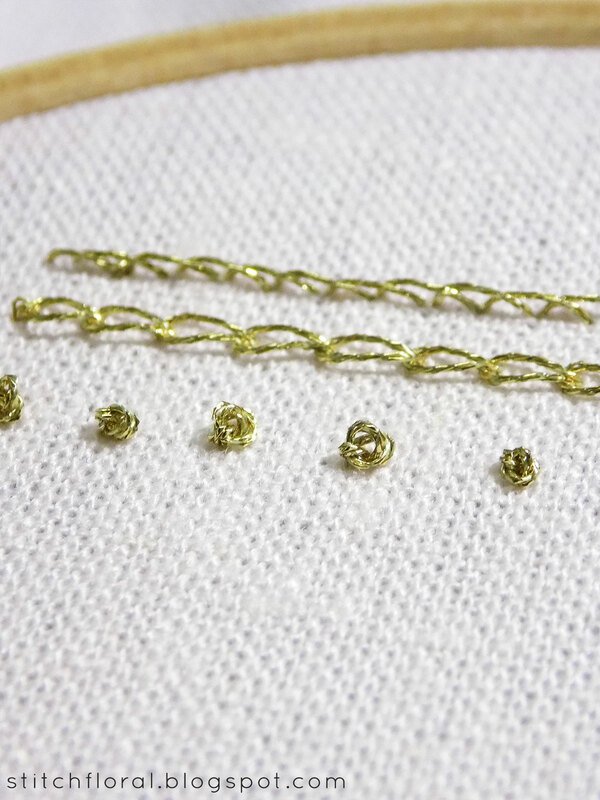 Will be on my list now :) Yeah, Diamant is hard to even compare to the stranded metallic, haha.